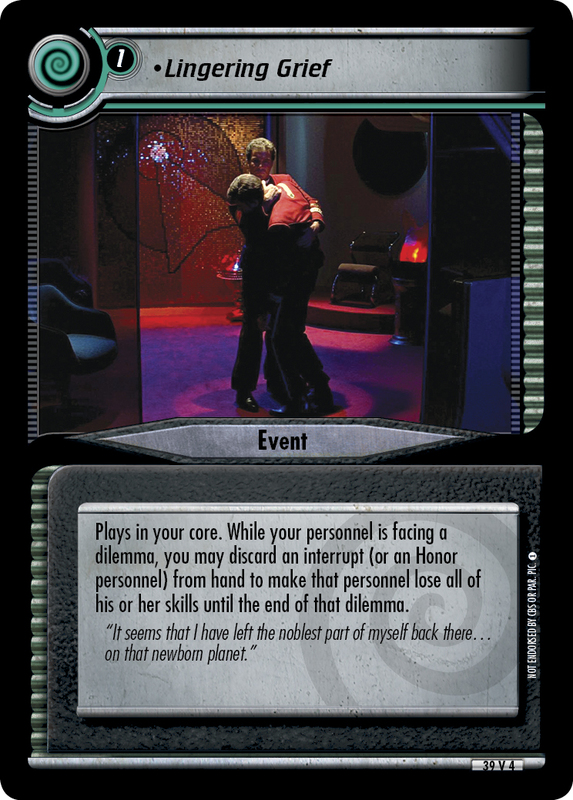 There are two dilemmas that have dominated my dilemma popularity series for as long as I've been keeping track: Hard Time, and An Issue of Trust. Part of the reason for Hard Time's dominance is that, historically, there hasn't been much competition for the '3-cost dual unconditional removal that doesn't go under' slot. An Issue of Trust doesn't have that excuse; there are many more mid-cost dual multi-stop dilemmas to choose from: There's Chula: The Chandra if you're a gambler, Intimidation if you're seeing lots of Borg or Klingons, Becalmed and Adopted Authority if you're facing anyone but Romulans, Agonizing Encounter if you're facing anyone who time traveled from 2006, the list goes on. Most people use some subset of those dilemmas in a standard attrition pile, depending on what they're going to face, so that at some point they can throw one of them together with Hard Time to get a one-under mission attempt stop. But, of all the ones I listed, the one that shows up the most frequently, and consistently across the years, is An Issue of Trust. What's most troublesome is that, like most of the other dilemmas, Trust's effect is also uneven, and significantly so. So while it could be treated like a dilemma that you'd tech in based on your anticipated match-ups, its average effect is still so good that everyone just includes it anyways, even in a world where Klag, The Central Command, and Neral are widely used. Now, here's the catch: the decks that are weakest against An Issue of Trust are also the decks that are strongest against Hard Time. Honor-rich decks with missions that have low Integrity requirements while their personnel sport high Integrity values are a nightmare for dilemmas that cost three and only remove one personnel. We've seen an insatiable appetite for Hard Time-esque dilemmas when The Weak Will Perish came out and Hard Time's dominance didn't even budge - we just saw The Weak being run alongside it. In that same time-frame, high-stat, low-requirement Integrity based decks have been very uncommon in high-level competitive play. So here's an effort to nudge the needle: Lingering Grief. It plays rough with An Issue of Trust, but specifically for the type of deck that punishes excessive Hard Time use. Only time will tell if it is enough to make a difference in overall dilemma use trends, but I'd personally love to see a shake-up at the top of next year's list.